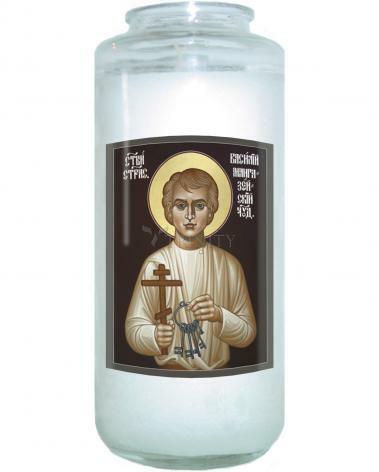 A fine art, giclée print adhered on a Will & Baumer Devotional Candle, 5-day, 6½" tall. Candle is clean burning, smoke-free and drip-free. Artist narrative included (not attached). St. Basil is one of a number of Russian saints referred to as “Passion-bearers,” because in accepting unjust suffering with patience and even love, they reflect the example of Jesus.